Another Filipino fighter will fight on the One FC: Reign of Champions event in Dubai. The filipino MMA fighter Vaughn "The Spawn" Donayre will fight Mohammed Walid form Dubai. Vaughn Donayre is a fighter previously fight in the URCC. Having his debut match in ONE FC Donayre wants to win this fight by KO in the front of the hometown crowd of Walid. Donayre has a record of 7W and 1 Lost, standing 5"10 and fighting out of Deftac Cebu. His last fight was a loss via Unanimous decision from the hands of Gokhan Turkyilmaz from Australia. Mohammed Walid will try to continue his winning streak. Walid has a record of 3W and his last 3 fights ends in a submission and KO. 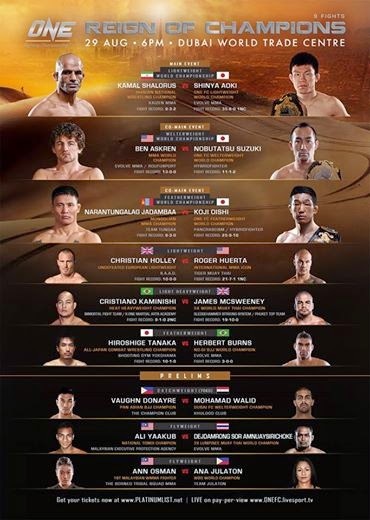 Check out the full fight card of ONE FC: Reign of Champions. It will be held in Dubai at Dubai World Trade Center. Also Ana Julaton will fight in this event againts the Malaysian Fighter Ann Osman.